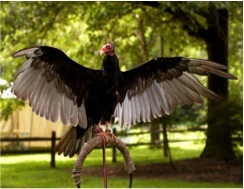 Earl: is a female Turkey Vulture who was found as a nestling and (illegally) raised by people. Attempts were made to habituate her to the wild and release her, but she was returned, unable to survive on her own. She was brought to RAPTOR Inc. in 1984 and is 26” tall, weighs 4.5 lbs. and has a 66” wingspan. Earl was thought to be male for many years until one day she laid an egg, revealing her true gender. She is quite a showgirl and frequently spreads her massive wings for program audiences.